Leah Hogsten | The Salt Lake Tribune Nathan Frodsham is hoping the ballot initiative to legalize medical marijuana in Utah passes so he can get off opioids and back to using the vaporized form of marijuana he formerly used when he lived in Seattle to treat chronic osteoarthritis pain in his neck from a degenerative disc disorder, Friday, June 8, 2018. Frodsham said he takes on average two Percocet pills a day. The main reason patients turn to medical marijuana is for relief from chronic pain. After all, it works. But opponents of a November ballot initiative that would make medical cannabis available in Utah for a wide array of patients worry that the proposal’s “chronic or debilitating pain” provision is too broad and would open the door to recreational marijuana use. 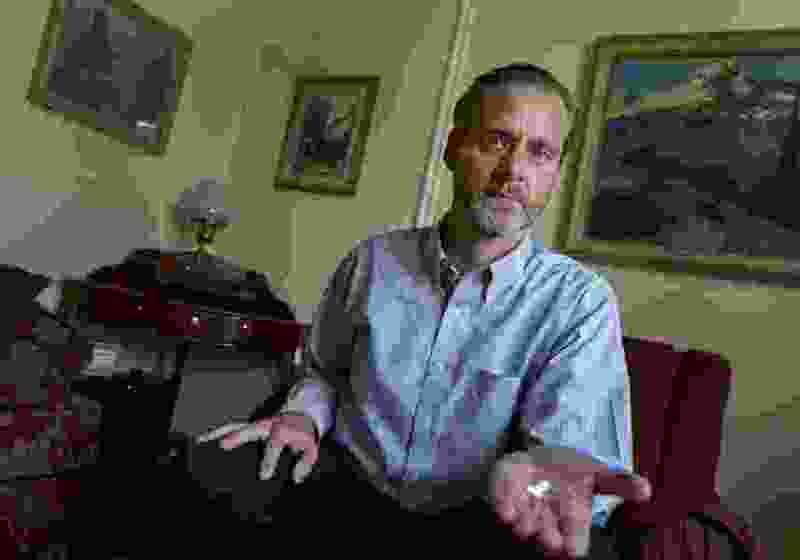 Groups fighting the measure — including the LDS Church and the Utah Medical Association — argue the tally of qualifying ailments and diseases is too expansive partly because it would let chronic pain sufferers get a card allowing them to use marijuana for treatment if their doctors believe they’re at risk of becoming addicted to opiate medication. The issue arose when attorneys for The Church of Jesus Christ of Latter-day Saints released a seven-page critique of the initiative. They focused on the measure's inclusion of chronic pain as a qualifying condition, which they warned "is hard to diagnose and verify." The lawyers also decried the frequency with which cardholders in other states cite pain as a reason for obtaining a medical marijuana card, a concern voiced by other opponents. In fact, pain relief is the top reason people seek medical marijuana in most states that allow it, an analysis by The Salt Lake Tribune shows. The newspaper gathered data from nearly all the states that collect it and have begun issuing cards under their programs. 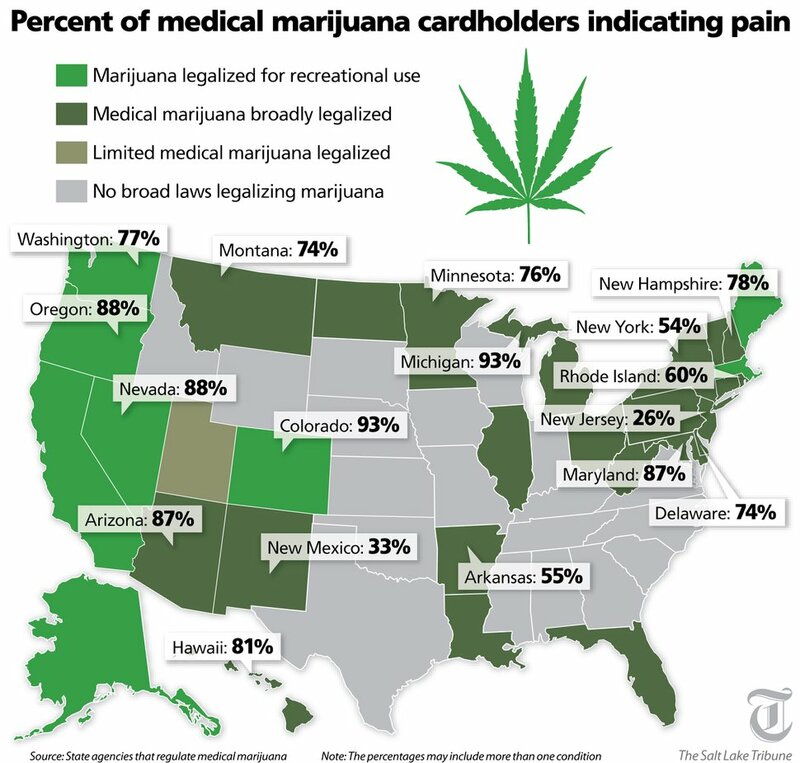 In most of the 29 states outside Utah where medical marijuana is legal, chronic, severe or intractable pain is almost always the chief reason cited for obtaining or renewing a state card to acquire, possess and use the plant. On average, about three of every four applicants tell their state they’re hoping to use marijuana for pain relief, the review shows. The numbers for chronic pain are likely inflated, because many states allow patients to mark more than one symptom or condition when applying for or renewing a medical marijuana card. Patients likely check chronic pain along with another qualifying condition. For example, about 40 percent of cardholders in New Hampshire indicated they had more than one condition that they hoped to treat with medical marijuana. But even after adjusting for possible overlap, chronic pain remains the top qualifying ailment. New Jersey saw a rapid rise in patients applying for a state marijuana card when it added chronic pain caused by specific conditions to the list of legally recognized symptoms. In Arizona, nearly 87 percent of its 167,107 patients got cards to treat chronic pain. Six percent obtained a card for more than one condition. Scientific research shows why medical marijuana is so popular for chronic pain sufferers. A sweeping 2017 report by the National Academies of Science, Engineering and Medicine found “conclusive or substantial” evidence that cannabis is effective in treating chronic pain. Count Nathan Frodsham among those gaining pain relief from medical marijuana. Frodsham suffers from a degenerative disease that is wearing away the discs in his neck, triggering excruciating pain and muscle spasms. Frodsham is vice chairman of Together for Responsible Use and Cannabis Education (TRUCE), a nonprofit group that backs the initiative. He also is a former patient who visited medical marijuana dispensaries when he lived in Washington state as a last-ditch effort to manage his pain. Cannabis products are known to act as anti-inflammatories. That’s good news for Frodsham, who is allergic to synthetic anti-inflammatory products. So his daily “microdosing” — taking a small amount of marijuana — helped treat his condition. He joined the now-yearslong effort to legalize medical marijuana in Utah after moving back to the Beehive State from Seattle. Utahn Mark Newman said he travels regularly to Nevada to buy marijuana there, where products from the plant are legal both medicinally and for all adults. He said he uses them to treat his frequent migraine headaches without taking opioid prescriptions. The list of conditions in the initiative is similar to those in other states. In addition to chronic pain, it includes HIV and AIDS, Alzheimer’s, cancer, Crohn’s disease and other intestinal ailments, epilepsy or other conditions that cause seizures, post-traumatic stress disorder, muscle spasms and autism. Voter approval of the initiative would likely lead to far more patients than a measure passed by the Legislature earlier this year. That law greenlights medical marijuana only for people who are expected to die within six months. It appears to be the narrowest law in the nation among the 30 states where medical marijuana is legal. State Rep. Ed Redd, a Logan Republican and physician who voted for the limited medical marijuana legislation, conceded that Utahns who could benefit from cannabis would be excluded. “There’s a lot of people out there who are not interested in getting high or using recreationally but have complicated problems,” Redd said. “They may not be on their deathbed, but they still have really complicated medical conditions” that aren’t treated through federally approved medications. Still, he said, he’s concerned about what he sees as an inevitable increase in the number of people using marijuana if the initiative passes and the possible consequences. The National Academies of Science, Engineering and Medicine report also indicated a correlation between cannabis use and the development of schizophrenia and other psychoses. Now that he’s back in Utah, Frodsham says he no longer uses marijuana to treat the pain for his condition. It’s too risky. For now, he’s prescribed a low dosage of Percocet, an opioid medication. “It’s more of a reactive. It’s not so good at preventing anything,” he said. “That’s what the cannabis did. I didn’t feel like I needed to take anything.